Why must we always use a bike for stunts.....why not a scooter? A well built scooter will do just as good a job for all your stunts as a BMX will, however, a scooter is just something different to set you apart from the crowd. 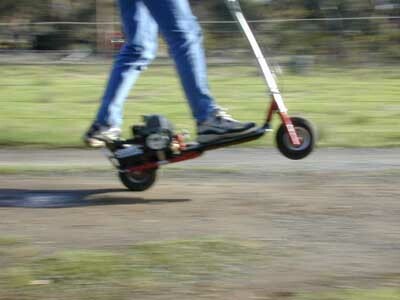 Although motorized scooters are capable of doing speeds in excess of 30kmh, the most fun can be gained from doing tricks at slower speeds. Speed in a straight line can get boring after a while. Lets start off with the essential tricks that everyone should know. Quite a usefull trick to be able to do, this one can take some practice. I have seen someone lift a scooter onto a waist-height platform. That takes a fair bit of muscle, and a lot of practice. First, start off by going slow, just a bit faster than it takes to stay upright. Plant your feet firmly on the deck, and both hands on the bars. Accelerate a bit so you have some momentum, then take your hand off the throttle so you can grip the bars properly. Now, bend down a little then jump upwards while still trying to keep your feet on the deck. Hopefully, if your feet don't leave the deck, you will have got at least one wheel off the ground. If you haven't, and your feet did leave the deck, then try again while leaning a little forwad and push your feet down as you lift up. Most of the lift comes from your arms, not your feet. You need to have just enough of your weight still left on the scooter to keep your feet attached to it. The best description would be that you have to jump, and lift the scooter with you. Become one with the scooter! If you have managed to get both wheels off the ground, all I can say is practice, practice, practice. Try it with more force, or maybe more speed to get more air. If you have only one wheel off the ground, then you must shift your weight a little. If only the front one came off the ground, then shift your weight forward a little and try again, the opposite for the rear wheel. If you got only the rear wheel to come off the ground, your halfway towards our next trick...the snakey, or S-bends as my friend calls them. Ever seen someone in a car tear off down the road with the tail of their car swinging around allover the place? Well...thats our next trick for your beloved scooter! For this you'll need to find yourself a road with some fine gravel or coarse hardpacked sand on it. Most of the time, you'll find this gravel on paths in parks and playgrounds. 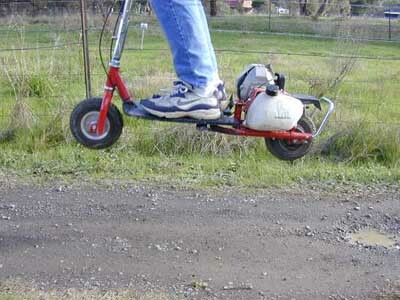 The back of the scooter I ride has often got way out of hand while performing this stunt at higher speeds so BE CAREFUL! I once was going at about 10-15kmh doing a snakey when the back of the scooter whiped around at a 90o angle to the bars....makes a nice trick if you can stay on! The basic concept behind this stunt is that you keep your weight forward, but not so far forward that you risk going over the bars. So...at about the speed it takes to stay upright, lean forward a bit and take most of the weight off the rear wheel. Then give it some throttle and move your feet around a bit while forcing them onto down onto the deck. You have to 'push' the back of the scooter from side to side. As you get faster (you have got the throttle all the way open haven't you?) you'll find that the back of the scooter will start swinging all by itself...this is when you back out and let off the throttle or else you may find yourself looking at the rear of the scooter at your side as the ground approaches rapidly. What better way to ride a scooter than with the front wheel off the ground? I have found this to be the trick that takes the most amount of practice to master. It does take some balance to keep upright while only one wheel is on the ground. There are two ways to do this stunt. One looks better than the other, but is a lot harder. On the Viza scooters, there is a 'bumper bar' on the rear of the motor. This provides a nice place to put a foot to shift your balance to the back. Place a foot on something solid at the rear of the scooter, preferably behind the motor. It has to be something that will not break, so a plastic mudflap would not be a good spot. As I just mentioned, the 'bumber bar' on the viza scooters is good for this. Lean back a bit, pressing down on the rear foot. If you lean too far back, your front wheel will leave the ground without too much effort. You can usually feel this by the handle bars being very light, and steering being useless. If this is not the case and the front wheel is still on the ground, a little bit of throtlle should do the trick. It is generally a good idea to have your hand on the rear brake at the same time as you are doing this incase the scooter feels as if it is going to flip backwards. By applying the rear brake, the scooter will throw itself back to the ground. This is usually preferential to fliping backwards and landing flat on your back. As my friend will tell you... it hurts. This is the harder of the 2 techniques to get to work and should preferably be attempted with a well tuned motor. Rather simple: place feet well back on deck, pull up the front wheel at the same time as you open the throttle. This is not hard in itself, but because you have to lift yourself at the same time, it relies more on your pulling up the bars than it does your balance. I suggest trying Techniue 1 before this unless you have a gutsy motor. Most often used to take slippery corners at moderate to high speeds, the broadslide is in my opinion, one of the most useful trick to know. Because the broadslide relies on skidding to perform sucessfully, you need to do it on surfaces that have poor grip. e.g fine gravel, grass or dirt. Maintain speed as you approach the corner. As you enter the corner, lean into the corner, and slightly forward, pushing down hard on the deck. Gently pull on the back brake. The rear wheel should now skid in the opposite direction to the way your leaning, and try to come around the front. To control the rear wheel skid, turn the front wheel gently in the opposite direction your leaning. As you approach the end of the corner, slowly release the rear brake. Not too quickly, or the wheel will grip and flick back, throwing you around a bit. Here is a good example of a broadslide on a motorized scooter. The only difference here, is that power is applied about half way around the turn, while still sliding, which makes it a powerslide.